I’m so excited to announce that my first book The Movement: A Children’s Story for Grown-ups is now available for sale as an audiobook! Thank you again to my wonderful narrator Alan Caudle! He did an amazing job capturing the story! I’m hoping you’re all wanting to grab a copy to hear it for yourselves, so you can at Audible.com (link below will take you directly to the book – audio sample available), Amazon.com via my Amazon Author Page list at the bottom, and even iTunes! It’s only $6.95! AND if you happen to sign up for Audible.com and make The Movement: A Children’s Story for Grown-ups your first purchase (you can get it free btw if you do), then Alan and I will receive an additional $50 bounty to split! Such an awesome program!!! Thanks, and please leave a review for both he and I to share! 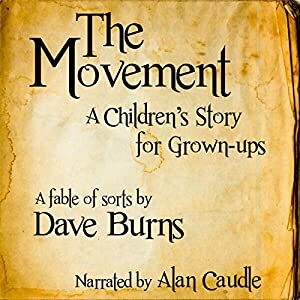 This entry was posted in Uncategorized and tagged Alan Caudle, Amazon, Audible, Audiobook, Author, book, Dave Burns, Indie, iTunes, Narrator, The Movement, The Movement: A Children's Story for Grown-ups, Uncarved, Uncarvedbooks. Bookmark the permalink.